← DYSGRAPHIA: ALL ABOUT BAD SPELLING. What skills lead the good life? Not math, being top dog, having the most toys or winning gold medals These do not matter. Think about this cartoon. The cartoon combines two of the skills most reasearch shows about how to walk life’s road successfully Read on and you will see my version of these skills. For those of you who are reading this blog for the first time, my life has been an undocumented experimental lab in figuring out the good life. Not unusual, the same for us all, but knowing mine explains the basis for some of my ideas. My life has been a bit different from most mental health professionals for I lived for twelve years in the trenches. Those twelve years were spent as a foster parent providing short-term care for troubled youth; all were thought to be criminal or otherwise out of control by the courts; all were awaiting a permanent placement. Some went from our home to jail, some back to their families, most on to group homes or residential treatment centers. We cared for over 300 kids, some for just a few days, others for months. I had been practicing as a mental health professional for 10 years before becoming a foster parent. My life as a foster parents was my mental health professional PhD. The main lesson was that if I did not control my feelings, I had no right to expect my foster kids or my two natural sons to control theirs. Hence my interest in emotional intelligence and controlling negative feelings, what I mean by Emotional Fitness. When we stopped being foster parents, I returned to work as a mental health professional and ended up directing children’s crisis teams in NYC before, during, and after 911. Another experience in a different set of trenches. Making me think I have been there and done that more than most gurus and therapists. Just as I returned to work, Daniel Goleman’s book about Emotional Intelligence hit the best seller list. I found his work appealing and that was when I founded my consulting business Emotional Fitness Training, Inc. (EFTI) Others informing my work include: Jerome Kagan, Marsha Linehan, James Garbarino, Bessel van der Kolk and Gregory Bateson and a numboer of other postmodernist thinkers. Enough back ground. We learn skills as we grow. You do not reach the point of reading this blog without having developed many of the skills essential to making it through life. Most of us learn our major life skills at our parent’s knees and at school. Few of us are aware we are learning life skills, just as our parents and teachers are not aware of all they teach. I hope all can become more thoughtful and aware of what has been learned and what is being taught. That awareness increases our ability to both control our negative feelings and model for others how to do the same. The four skills below are the ones I think matter most if the people of our world are going to continue to exist and finally come together to bring peace to this earth of ours. Skill number one: Being able to deal effectively with negative feelings. Doing so involves self-soothing as well as knowing what is real and what is fantasy or wishful thinking. Can you calm yourself when a strong emotional or negative thought begin attacking you? Harder than the gurus’ preach, but possible. Here is one of my free EFTI Poster Coaches designed to promote self soothing. If you want to teach skills, developmental age and stage need thinking about. Parents need to start teaching self-soothing skills from birth on; when school starts, coding reality aka critical thinking training starts and can blossom with guidance when adolescence begins. Do remember 30 to 50% of all populations seem unable to think abstractly – what is meant by critical thinking. Not a politically correct idea, but useful to keep in mind as a professional and parent. Skill number two: Getting along with other people. Which is why manners matter. Intellectual gifts matter, but many studies show how you get along with other people matters much more. Manners are essentially about getting along by respecting others. Manners also involve teaching kindness; kindness builds empathy which is another key emotional intelligence skill. As the cartoon demonstrates, however, good manners need to go hand in hand with being strong able to defend yourself; bullies see manners and kindness as weaknesses and take advantage. So as part of my advice about manners to parents and others always suggests karate training. My youngest son was skinny and looked as if he could be easily bullied. He was also basically a kind and caring kid. He started karate training at the age six. By the time he was ten, he could put down teen age bullies twice his size. I am so glad his father talked me into letting him get karate lessons. 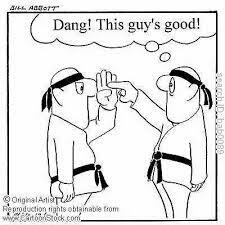 The best combination of manners and self-defense are found with the Peace Dojos. What is a Peace Dojo? A karate master who teaches conflict resolution which is an important part of manners. I further suggest parents make such training a family affair as it promotes family fun and bonding in addition to improving everyone’s physial fitness. Skill number three: Realistic expectations. Media and the happiness gurus promise too much too quickly; at least in terms of the sound bytes they put out. No one can meet all their dreams as the “Just Do It” rants suggest. As a mental health professional I love SMART GOALS. They bring reality to dreams. Kids can start learning about goals once you start them on a token reward system. 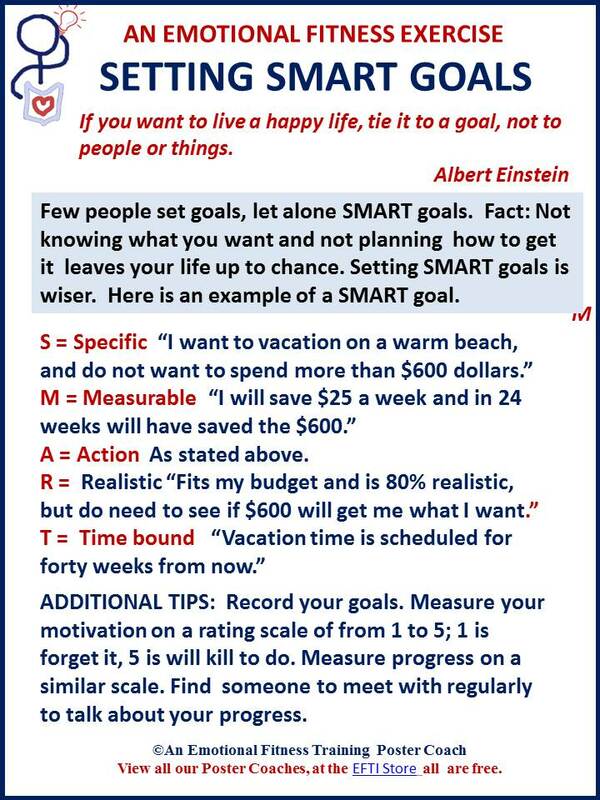 Here’s another of EFTI’s free poster coaches about how to set SMART Goals. Few professionals factor luck into the equation of what makes people who they are. One of the reasons Jerome Kagan, retired Harvard researcher is my top guru is he honors luck or chance. He once listed it as one of eight factors that determine who we are and how we behave. Curious about the other seven factors? Ordered according to age and stage: Genes; birth order; who you think you are like or want to be like; what parents do; social competencies, size of community you grew up in; historical era you were most influenced by. Chance was number eight on his list. Making peace with the fact that bad things happen essentially involves how one makes sense of good and evil. I am interested in Post Modern thought except when it throws out useful knowledge. Happens more often than one would hope. An example? Many atheist friends who claim the post modern title do not see any value in religion. Runs against the millions who find a religious explanation for life’s ups and downs useful. Do not get me wrong, “I hate hateful theology.” But reality demands honoring good theology as well. Deconstructing or taking apart both matters. I have been a wandering agnostic most of my life. As a teenager raised by agnostic parents, I was angry I had not been baptized and had to take that on myself as a teen ager when I decided to join my friends at the local Presbyterian Church. When that church proved to be lacking in “Christianity” for a number of reasons and I had a Philosophy Professor who called himself a Quaker Buddhist Jew, I became a Quaker. Then I married a Jew and I converted for a third and I think final time. What appeals to me most about Judaism are three things: the lack of proselytizing, the edict to act to repair the universe, and Torah study which when diligently pursued is an exercise in critical thinking. Two rabbi’s, one parsha, equal ten interpretations. Anyway, Kagan also notes throughout most of his work, that we need to make sense of things and the explanations we create drive our behavior. His ideas about meaning making are supported by James Garbarino, Robert Coles, and Bruce Perry’s work and research which is based on their experience with trauma victims. My experiences as a foster parent and a therapist agree with the insights of those cited above. A blog business update. I am going to merge my two blogs in the months to come. 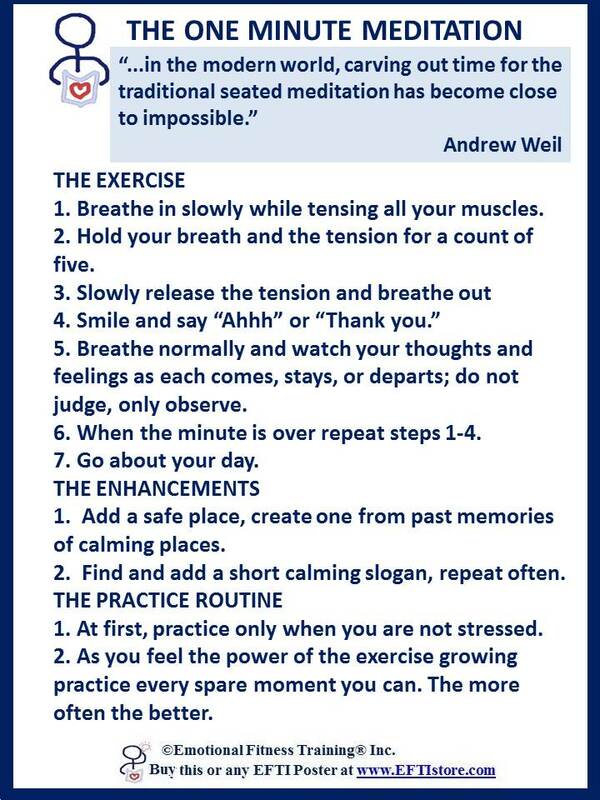 Then there will be four or five posts a week focused on Emotional Fitness Training. Some will be more focused on Emotional Fitness Tips everyone can use; but contain information for parents. A few will be devoted to parenting or teaching, but also be useful to the general public. As I age, I need focus more intently on my dreams. Only feeling the need to post on one blog will help with that and help me stay strong. My post is more about the sunrise of peace, I would like to see shedding its light in all hearts than an actual sunrise. I do wake up before the sun off and on; I also sleep in off and on. Both benefits of retirement. Browse the EFTI store for a free downloads of emotional fitness tips, exercises, quotes all designed to improve your #emotionalintelligence. The poster coaches are best used printed up in color on card stock and then posted where seen often and serving as you personal staying strong, emotional fitness coach. If you down-load some of our poster coaches, please think about make a donation, via a tip. We are not for profit but only because we make no profit, not because we are tax deductible and allowed to accept donations. Tips are our way of asking for help. This entry was posted in Parenting Issues and tagged adoptive parents, Emotional fitness, Emotional Fitness Training, Emotional Health, emotional intelligence, foster parents, Health and mental health, Katherine Gordy Levine, Parenting advice, postaday, Success, Success skills. Bookmark the permalink. Great post as always. I teach SMART goals to the unemployed folks I work with. Your examples are great.I hope you are having a wonderful weekend. Thanks for your motivating and very practical posts. Hugs from Canada! Thank you Darlene. Am getting overwhelmed, but are not we all. I think your new book is out, give me the link and I will promote.